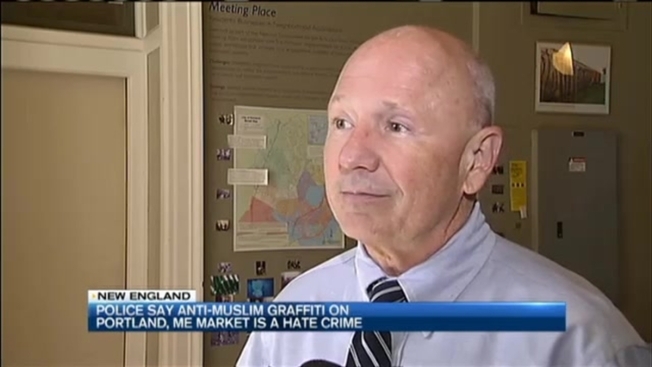 The owners of a market in Portland, Maine, are trying to clean up and move on, one day after an anti-Muslim message was spray painted on the side of the building. Surveillance footage from outside the Halaal Market shows a white male wearing a black hoodie spray painting the building early Sunday morning. He wrote the word Allah, along with a sexual reference. Police are investigating it as a hate crime, and have turned the investigation over to the Maine Attorney General's Office. "The police officers are doing their job, and they're working with us," said Halaal Market customer Issa Adaan. "They'll catch him one day." The manager at the market who spotted the graffiti Sunday declined to do an interview Monday, but said the business will stay open, and employees will remain positive. "I just take it easy. It's not a big deal," said Adaan. But the Legal Director of the Maine ACLU said hate crimes are serious, and require a community response. "Actions like this are designed to make people feel like they're not a part of our community, and it's unfortunate that immigrants might feel like they're going to be retaliated against, that they're going to be threatened further if they speak out," said Zach Heiden, Legal Director at the ACLU of Maine. While Heiden did not have statistics available Monday, he said there has been an increase in religious and racial discrimination in Maine in the last decade. Portland Mayor Michael Brennan said there has been cases of swastikas painted on Maine synagogues. "This isn't something that we tolerate and we need to stand up and say this is not acceptable behavior within the city of Portland," said Mayor Brennan.